BrewBike’s new location in Café Bergson. BrewBike is now a subcontractor of Compass Group, and plans to expand to other college campuses. After collecting over $800,000 in seed money, BrewBike is opening a new permanent location in Main Library’s Café Bergson on Monday — and will expand even further in the future. Announced in September, the development is a long time coming for Lucas Philips, the founder of BrewBike. The SESP senior started BrewBike, which got its name from the bike out of which it sells cold brew coffee, as a freshman in 2016. The business has come a long way since then. In January 2018, Philips connected with Randy Paris, who at the time was enrolled in University of Chicago’s Booth School of Business. Paris, now BrewBike’s CEO, was vexed by the lack of readily available good quality coffee in Chicago. He discovered Brewbike and was immediately interested. The partnership was mutually beneficial; because Paris was a student at University of Chicago, he could enter into the College New Venture Challenge, in which BrewBike placed fourth. Philips entered BrewBike into Northwestern’s VentureCat competition last spring as well, where it placed second. Though impressive, the winnings from the competitions weren’t enough. Matt Matros, founder of Limitless Coffee and Protein Bar, was one of those investors. Matros and Philips met when Matros spoke at Northwestern about his company Protein Bar, and was approached by Philips and some other students about starting a coffee shop. Philips was having trouble getting started, due to conflicts with Sodexo, the company that oversaw on-campus dining at the time. “And I said ‘Have you thought of alternative methods, like a bike or a backpack or a stand or a kiosk?’ Just with that one little nugget they went off to the races,” Matros said. But with Sodexo out of the picture, things have changed. BrewBike is now a subcontractor of Compass Group, the University’s new food provider. Expanding through a contract with Compass is one of three options for increasing reach, Philips said. The other two strategies for growth don’t require Compass’s help. One is for BrewBike to send Northwestern students to kickstart a location on another campus — a plan is currently in the works at the University of Texas at Austin. 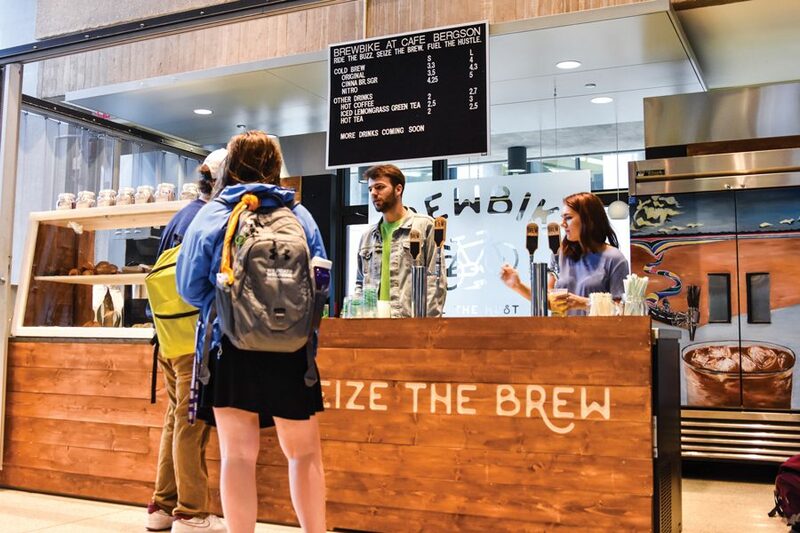 The other is to bring students from other colleges to Northwestern to learn how BrewBike works, with the hope they’ll be able to start an extension of the business on their own campus. BrewBike also plans to expand to UChicago, using a combination of these two business plans. The student-run nature of BrewBike is central to the branding and, Philips said, to the success of the company. These special locations, as Philips calls them, are already paying off. Rahma Almajid, a Communication sophomore, is a frequent coffee drinker and sometimes visits the BrewBike location in Annenberg Hall. In addition to the location at Café Bergson, BrewBike will have cold brew for sale in the c-store at Norris University Center starting early this week, in addition to the Annenberg location and the bike itself. No matter where BrewBike goes, Paris said, it will always have its roots at Northwestern. “All BrewBike’s success is a testament to how talented (Philips) is and the team at Northwestern and how effective they’ve been,” he said.